Colney is a small parish on the western outskirts of Norwich. It is located southeast of Bawburgh and northwest of Cringleford. 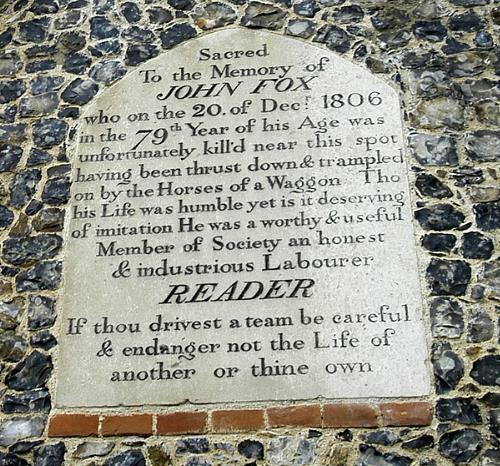 The village is listed in the Domesday Book and the name is Old English for ‘island, or dry ground within a marsh, belonging to a man called Cola’. 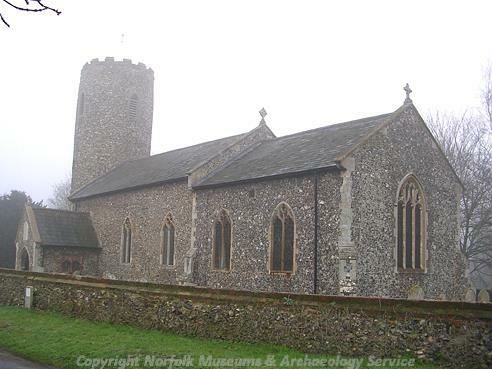 The parish contains Norfolk and Norwich Hospital, Norwich Research Park and part of the University of East Anglia. The presence of these modern developments has led to some extensive archaeological work in the area allowing us to understand the development of use of the landscape of the parish. 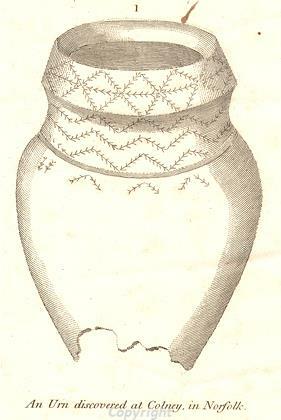 Bronze Age burial urn excavated in Colney in 1799. There is extensive evidence for prehistoric activity in the area dating from the Mesolithic period. At several sites Mesolithic blades and flakes (NHER 11639 and 35739) have been recovered but the most intensive period of activity was in the Neolithic. Excavations have revealed several Neolithic flint production sites (NHER 9332, 24017 and 28277) and a buried Neolithic occupation layer. The prehistoric sites are not only related to production however, as several Bronze Age barrows (NHER 9335, 9336, 31871, 36401 and 36402) and a Neolithic or Bronze Age henge type monument (NHER 36402) has also been identified from aerial photographs. One of the Bronze Age barrows (NHER 9335 and 9336) was excavated in 1799. Activity in the parish continued into the later prehistoric period and Iron Age ditches and pits (NHER 31871) were excavated on one site. Iron Age pottery (NHER 28277) and an Iron Age brooch and coin (NHER 24833) have also been found. These show that the area was a very important focus of activity throughout the prehistoric period. There is considerably less evidence for Roman activity, although several scatters of Roman pottery (NHER 28277, 29058 and 35739), Roman coins (NHER 9338, 15459 and 18497) and individual Roman brooches (NHER 21949 and 29088) have been recorded. Roman ditches, gullies and pits (NHER 9332) were found close to the Research Park, but it is unclear whether these are related to settlement or some other type of activity. There is more evidence for activity in the Saxon period. This seems to be concentrated in the north of the parish. St Andrew’s church (NHER 9339) has a round Saxon tower and is dated to 1050 to 1100. Finds of Early Saxon brooches (NHER 19139, 19191, 19825, 20859 and 20861) just to the west of here suggest that Early Saxon cremations and burials took place here. Other Late Saxon finds including a Late Saxon coin (NHER 20194) and a Late Saxon brooch (NHER 20860) may be more indicative of occupation but no clear site for settlement can be identified. There is more clear evidence for medieval and post medieval occupation centred around the church. Excavations in advance of the southern bypass development recorded a medieval wall and pit (NHER 9341). Medieval pottery (NHER 9397, 28277, 28326 and 31871) has also been recovered from a variety of sites. These and metal finds including a silvered medieval strap end (NHER 20860), medieval buckle (NHER 20859) and part of a medieval copper alloy vessel (NHER 9340) have probably been spread around the parish by manuring during this period. There are several post medieval buildings within the parish. Colney Hall (NHER 9415) was built in 1767 and an elaborate park (NHER 30499) was planted around it. A post medieval silver vervel (NHER 24833) found here may have been lost during hunting with a hawk. Part of the park is now used as a woodland cemetery. The Old Rectory (NHER 9420) and Old Hall (NHER 11623) are also post medieval in origin. Another post medieval building may have stood where a post medieval wall (NHER 9344) was excavated on the site of the bypass. The frequent finds of post medieval pottery (NHER 14280 and 9332) are probably related to agricultural practices and there are also the remains of a post medieval clay pit (NHER 9407). Megan Dennis (NLA), 15th September 2005.